We don’t know what your first reaction will be when you see these pictures – but we were left absolutely speechless! Which is not exactly normal for us here in bloompapers! 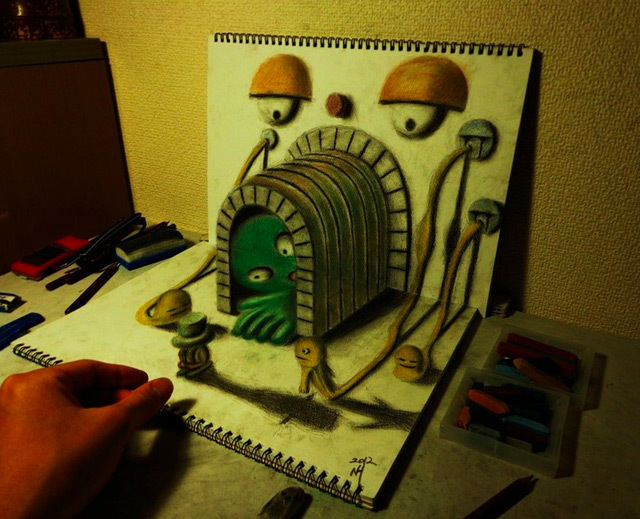 Japanese artist Nagai Hideyuki has achieved a spectacular illusion on paper – managing to create 3D images of beautiful abstract images, including bridges, cartoon characters and mysterious looking landscapes. Check out the links on his webpage where you can watch a video of him in action – it will take your breath away. For those of us without that artistic genius running through our veins, it has at least inspired us to give it a go! Happy Weekend!